New Zealand IT spending is forecast to reach NZ$11.4 billion in 2015, a slight decrease of 0.8 per cent from last year, ahead of worldwide spending forecasts which are predicted to drop 5.5 per cent. According to Gartner findings, a decrease in spending on devices across the country, including PCs, tablets, printers and mobile phones and communications services is behind the overall decline. Globally speaking, worldwide IT spending is on pace to total $3.5 trillion in 2015, a 5.5 per cent decline from 2014, which analysts attribute to the rising U.S. dollar. In constant-currency terms, the market is projected to grow 2.5 per cent while in Gartner's previous forecast in April, it had forecast IT spending to decline 1.3 per cent in U.S. dollars and grow 3.1 per cent in constant currency. At a regional level, Asia Pacific IT spending is forecast to total US$743 billion in 2015, an increase of 0.7 per cent from 2014. However, in constant-currency terms, the market is projected to grow 4.5 per cent in 2015, revised downward by 0.5 per cent from last quarter’s forecast. Across the ditch the market bucks the trend, with Australian IT spending is forecast to reach almost A$78.1 billion in 2015, an increase of 2.1 per cent from 2014. In this growth, IT services represents the largest spending category at A$28.8 billion, while software is the fasting growing area of spending, expected to grow 9.8 per cent in 2015 to reach almost A$9.4 billion. “We want to stress that this is not a market crash,” says John-David Lovelock, research vice president, Gartner. “Such are the illusions that large swings in the value of the U.S. dollar versus other currencies can create. However, there are secondary effects to the rising U.S. dollar. 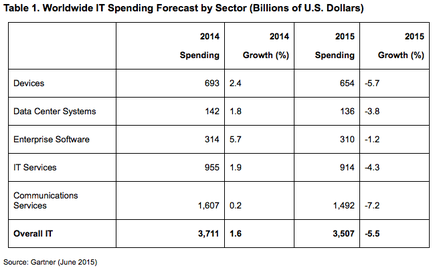 The Gartner Worldwide IT Spending Forecast predicts that communications services will continue to be the largest IT spending segment in 2015 with spending at nearly $1.5 trillion. However, this segment is also experiencing the strongest decline among the five IT sectors. Price erosion and competitive threats are preventing revenue growth in proportion to increasing use within most national markets. In the device market, mobile phones continue to be the leading segment, with growth in Apple phones, especially in China, keeping overall phone spending consistent. However, overall smartphone unit growth will start to flatten.